PHOENIX. 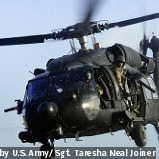 In a contract with the Defense Advanced Research Projects Agency (DARPA) engineers at Honeywell will continue to improve three-dimensional visibility and safety for U.S. military helicopter pilots experiencing inclement weather and harsh environments. 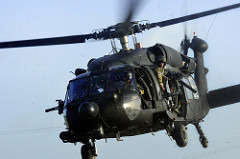 The contract is part of DARPA’s Multifunction Radio Frequency effort in which Honeywell engineers will program, update, and integrate the company's Synthetic Vision Avionics Backbone (SVAB) solution on U.S. military test helicopters such as the UH-60 Black Hawk. The avionics solution combines Honeywell’s Federal Aviation Administration-certified synthetic vision products for business and general aviation with a software backbone developed for DARPA, officials say. Engineers will update the synthetic vision system to support the next phase of the Multifunction Radio Frequency program to fuse information from DARPA's Advanced Rotary Multifunction Sensor radar along with terrain and obstacle databases and satellite imagery. "By processing data from multiple sensors and developing a 3-D synthetic rendering of the exterior view in degraded conditions, we can create a safe environment where military pilots can turn degraded visual environments into a tactical advantage," says Howie Wiebold, manager of business development at Honeywell Aerospace.